We make wreaths and garland with our own Fraser fir brush, and Donna makes bows in a wide variety of colors. With some advance notice we can craft wreaths to your individual wishes - call or email. We always have a good supply of 12-inch and 16-inch wreaths, the most popular sizes. 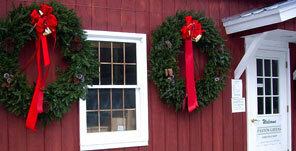 We can make 24" (shown in the photo), 36", and 48" for a bold holiday look on your barn or business. We ship 12" wreaths (22" outside diameter) by Fedex ground anywhere in the lower 48. 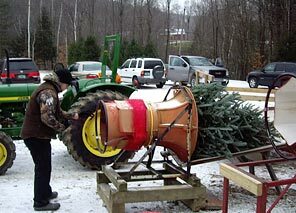 Paxton Greens is a family-run Christmas tree farm in Cuttingsville (Shrewsbury), Vermont. We welcome visitors and families to select and cut their own Christmas tree, or select the tree and we will cut it for you. 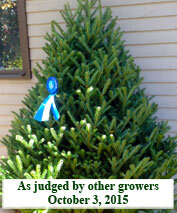 For those who shy away from the do-it-yourself experience, we always have some pre-cut trees available. 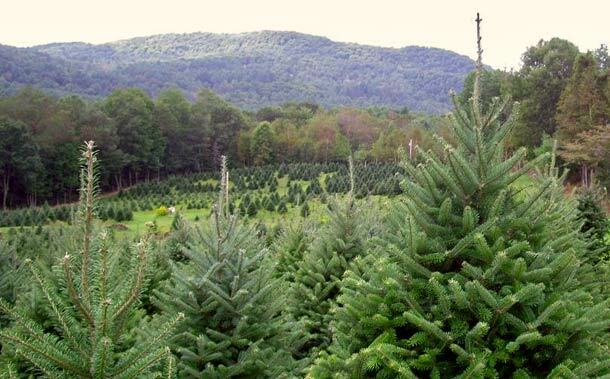 Our trees are primarily Fraser and Balsam fir, but we also have some gorgeous white pine. Our Christmas shop always has a good selection of freshly-made wreaths, top quality tree stands, a warm wood stove, and hot mulled cider. We supply hand saws (NO chain saws, please), tractor and trailer, sleds, and free netting of your tree. Hours of operation are 10 am to dark, Fri thru Sunday, [not open Mon - Thurs] Thanksgiving until December 9, or UNTIL SOLD OUT. Choose and cut trees are $50.00 for any size, pre-cut trees start at bargain prices.